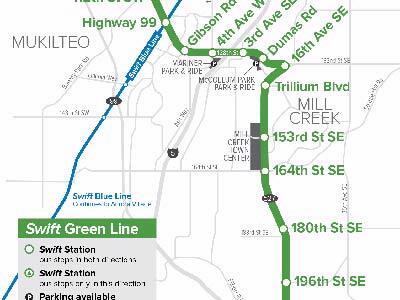 Snohomish County, Wash. – KIRO 7 traffic reporter Tracy Taylor will emcee the Swift Green Line Grand Opening celebration from 11 a.m. to 2 p.m. on Sunday, March 24 at McCollum Park, 600 128th Street SE in south Snohomish County. Community Transit’s second bus rapid transit line will officially begin service at noon with a VIP ride departing from the event. The Swift Green Line is Community Transit’s second bus rapid transit line. Construction on the 12.5-mile project started in 2017 between the Canyon Park Park & Ride in Bothell and the new Seaway Transit Center near Boeing Everett. The agency’s first BRT line, the Swift Blue Line, began service in 2009 along Highway 99 between Everett and Shoreline and is the agency’s most popular route.